The Linksys RE4000W N600 Dual-Band Wireless Range Extender is a wireless dual-band range extender with two (2) Ethernet ports that simultaneously work for both bands. It is designed to resolve wireless coverage and extend the wireless signal for both 2.4 GHz and 5 GHz networks. Wi-Fi Protected Setup™ (WPS) - When the WPS process is active, the light flashes slowly. When the WPS is successful, the light is continuously lit. If there is an error, the light flashes quickly (every second) for two (2) minutes. Reset button - Press and hold the Reset button for five (5) seconds to reset the range extender to its factory defaults. You can also reset the device from the Administration > Factory Defaults screen in the range extender’s web-based setup page. Power switch – powers the extender ON or OFF. NOTE: This functionality is ONLY available in the European versions of the Linksys RE4000W. Ethernet ports - You can use either one of the Fast Ethernet (10 / 100 Mbps) ports to work as a wireless bridge to instantly connect any wired Ethernet device to a wireless network. The green LED is lit when an Ethernet device is connected and active on this port. The extra Ethernet port can also be used to connect another wired client. IMPORTANT: The Linksys RE4000W ONLY supports Wired Equivalent Privacy™ (WEP) with hexadecimal format security key. If your gateway is set up with a WEP ASCII format, contact your Internet Service Provider (ISP) for assistance. 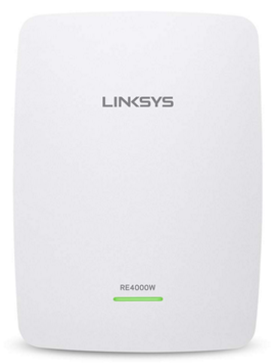 NOTE: For more details about this product, visit the Linksys RE4000W Product page to browse for more troubleshooting articles, downloadable user guides or firmware updates and other support information.